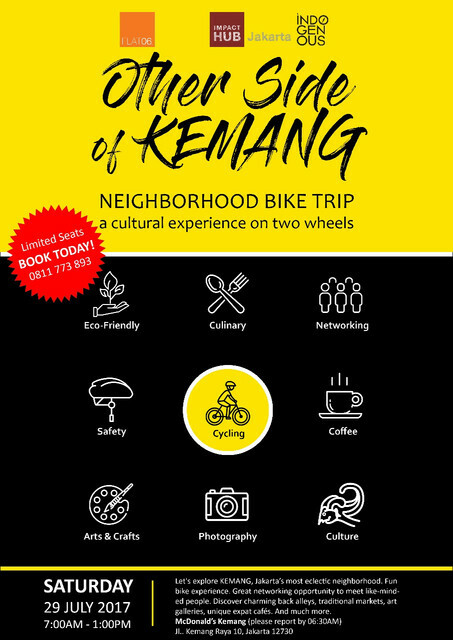 The exciting "OTHER SIDE of KEMANG" Neighborhood Bike Trip is BACK!!!!! Let's explore KEMANG, Jakartas most eclectic neighborhood. Fun bike experience. Great networking opportunity to meet like-minded people. Discover charming back alleys, traditional markets, art galleries, unique expat cafÃ©s. Spend half a day biking. Open to all level of abilities. . .
An awesome collab of impact travel enthusiasts @theflat06 @impacthubjkt @indogenous, through @theflat06trips, to curate unique travel experiences. . .
TRIP LEADER: DIAN HASAN @dianhasan, int'l globetrotter, brand story teller, and Co-Founder of @coworkinc & @impacthubjkt, who will share sights+sounds+stories of a Jakarta you never knew existed. .
Q: Do you provide any snacks, drinks or lunch during the event?